Meanwhile, to balance the polar freeze in North America, Australia is sweating under record highs during a severe drought. It's so hot - 44 in Perth this weekend, up to 50 degrees further north - that bats are dropping from the trees by the thousand across the country, and even kangaroos are swooning in the heat. I can just imagine the shimmer in the Outback, the red dirt bone dry under a merciless sun blazing from a cobalt sky. Beautiful, but deadly. One report I read mentioned that Winton in North Queensland is famous for being one of the hottest places in the state. When I was there in 2010 they'd just had drenching rains after eight years of drought and the place was lush with tall grass, the trees green and fresh (apart from the palms, which looked like chimney brushes, thanks to the plague of hungry locusts that followed the rain - Nature will always get you, one way or the other, in Australia). The farmers we stayed with viewed it all with a philosophical wryness, having sold most of their cattle when their grass withered up and after the rains unable to buy in more with the prices risen, or to rent out their grazing with everyone in the same position. Then, of course, in 2011 Cyclone Yasi, category 5, whipped through a bit further south, wrecking Townsville's seafront - now, as we saw in November, fully restored and improved, and a real asset to the town (stingers allowing, see above re Nature) - and causing huge damage to places like Tully and Innisfail. I remember seeing footage of the floods on the news that included an aerial shot of a car being swept down an overflowing river, and it was close-up enough to see the person in the passenger seat, who looked up at the helicopter and then, in an unforgettable gesture of despair, laid their head down on their arms on the dashboard. I still wonder sometimes how that story ended. But such scenes must be hard to remember now for people sweltering in the heat wave and worrying about the bushfires. 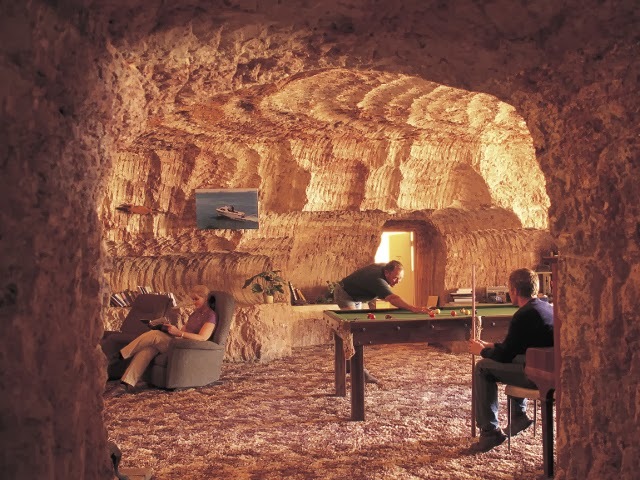 For sure, there's not going to be much action visible in Coober Pedy, in South Australia, currently hitting 43 degrees: they'll all be tucked away in their underground houses, burrowed into the rock where it's always a comfortable 23 degrees. They have teeth-marks on their ceilings there, you know.